Trevor Moore scored his first NHL goal and Michael Hutchinson made 28 saves for his first shutout as a Maple Leaf as Toronto blanked the Vancouver Canucks 5-0 on Saturday night. Trevor Moore was an undrafted walk-on at rookie camp in the summer of 2016. Just over a week ago, Michael Hutchinson was battling to get back in the NHL. The perseverance shown by both players paid off Saturday. 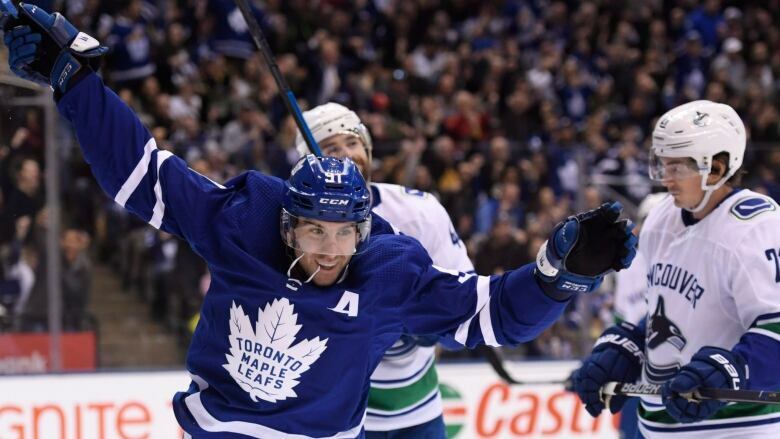 Moore scored his first NHL goal and Hutchinson made 28 saves to record a shutout in his second emergency start for Toronto as the Maple Leafs blanked the Vancouver Canucks 5-0. "It was surreal," Moore, 23, said following in his fifth NHL game. "I got chills." Hutchinson, meanwhile, was playing for the AHL's Springfield Thunderbirds when Toronto acquired him from the Florida Panthers on Dec. 29 in a move aimed at boosting the organization's goaltending depth. The 28-year-old was pressed into action Thursday with both Frederik Andersen (groin) and backup Garret Sparks (concussion) out injured, finishing with 30 saves in a 4-3 loss to the Minnesota Wild. Now he has a shutout for the team he cheered for growing up in nearby Barrie, Ont. "It's hard to imagine," Hutchinson said of how much his life changed in only eight days. "Being in Springfield, you don't know where your season's going and how things are going to turn out." The shutout was his fourth in the NHL and first since Oct. 28, 2016, when he was a member of the Winnipeg Jets. "You're just kind of grinding away [in the minors]," Hutchinson added. "Things change really quick in pro hockey. "Definitely looking forward to tonight [and] getting a chance to take a step back and really enjoy this moment." Andersen and Sparks were both in Toronto's locker-room to congratulate Hutchinson before their new teammate had time to peel off his gear that still includes Florida's colours. Auston Matthews had a goal and two assists, Andreas Johnsson scored once and set up another, and John Tavares and Igor Ozhiganov provided the rest of the offence for Toronto (27-12-2), which snapped a two-game slide that came on the heels of five straight wins. "We looked tired," Canucks head coach Travis Green said. "That's not a team that you really want to play tired against." Playing a third game in four nights, Vancouver was minus star rookie centre Elias Pettersson after he injured his right knee in the second period of Thursday's 2-0 loss to the Montreal Canadiens. Green said the 20-year-old, who leads the Canucks and all NHL rookies with 42 points, is expected to miss at least a week with a slight sprain to his medial collateral ligament. Vancouver went 3-3-0 in the six games without an injured Pettersson earlier this season, but scored just 11 goals over that span, including nine in regulation. "If you want to win hockey games, you've got to score," Canucks centre Bo Horvat said. "I'd be more worried if we weren't getting our chances, but we are. It's just a matter of bearing down." The Leafs made it 2-0 at 14:30 on Moore's first in the NHL. The speedy winger from Thousand Oaks, Calif., blew past Derrick Pouliot — it wasn't a good period for Canucks defenceman — before beating Markstrom between the pads. Moore tried not to crack a smile on the bench as the crowd at Scotiabank Arena rose to its feet in approval after the milestone was announced. "It was really tough to keep a straight face," he said. "It was really cool." Johnsson made it 4-0 with his ninth, firing upstairs shortside on Markstrom at 11:55 before Ozhiganov added insult to injury with his second at 14:49 when the defenceman fired a pass that went in off Gudbranson's skate. From there, the Leafs made sure Hutchinson got his shutout. "It's an amazing feeling," said the goalie. "It's something you grow up thinking about."